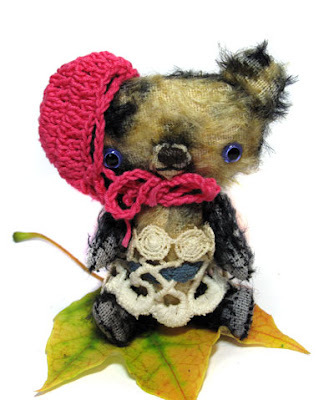 little *half moon* in the autumn sky.... come see the tiny two-toned miss and her wee friends today on my fall bears update! 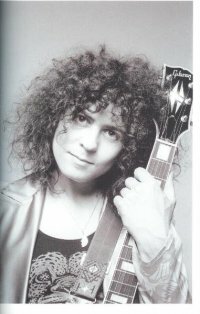 "oh like the precious star you are..."
today is special for another reason: it's the birthday of my hero, Marc Bolan of T. Rex. (fellow Libra!). From the first time i heard a few chords from Electric Warrior i was transfixed (someone was playing a cassette of it- that gives you an idea how many years ago that was!). Marc's music has deeply touched so many fans and will always be a huge inspiration to me. on a previous trip to the UK during the mid-1990s, i visited his memorial at Golders Green crematorium and "the tree" where he died as a passenger in a car crash just a few weeks before his 30th birthday in 1977. the Bolan tree, which was then in a sad state of decline, has thankfully now been officially recognized as a rock shrine. 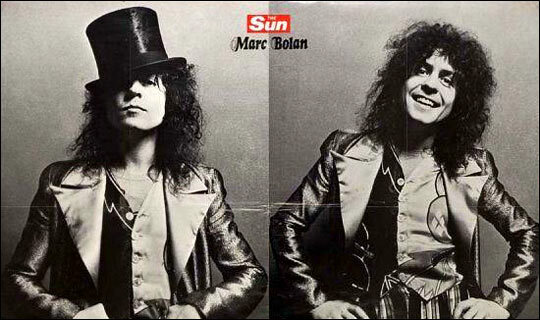 Bolan was a small man ("the bopping elf") with a fierce belief in himself, who named his band after the biggest animal on the planet. he was indeed a precious star- our 20th century boy forever. new bears update this friday! okay folks, i've given in! i've uploaded my first ever video on youtube! 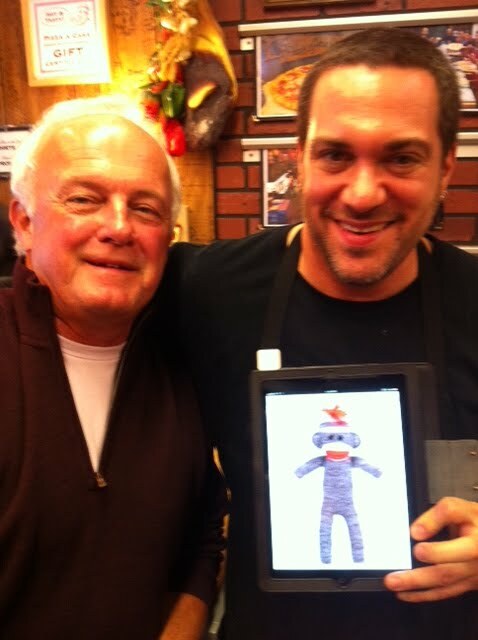 it was the only way i could figure out how to share my video with everyone and different web browsers. so here it is, another sneak peek for my update this week... ta da.... dancing cat necklaces! they will dance to anything but they do seem to love old jazz. i made three black kitties (one was doing a top hat and cane routine off camera). hope you enjoy my little video! 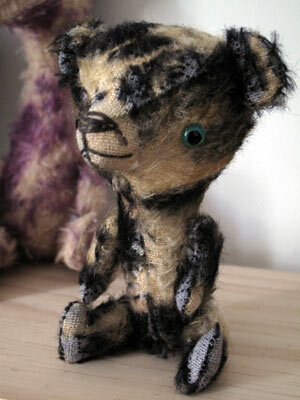 a new OOAK stick bear in wild black/ white tie dye mohair. he's like a black and white cookie! yummy! made for Collins Gifts upcoming 6th annual Artists signing & web show. he will be getting dressed today. 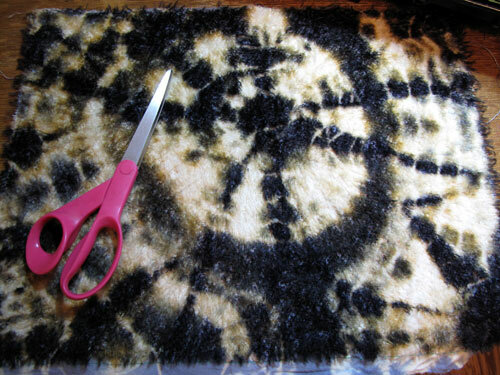 a different tie dyed mohair in tortoise shell black/ white/ with a hint of orange. ...a pair of "twin" pointy nose bears- each with unique markings. i am loving them already. they will in my web update this week! 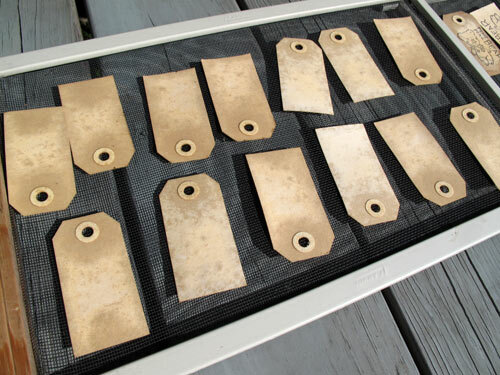 i made a nice bundle of prim hang tags when the weather was just right, sunny with minimal wind so they wouldn't blow all over the yard (i found a few astray hang tags under the deck, lol). gotta take advantage of every sunny day we have! 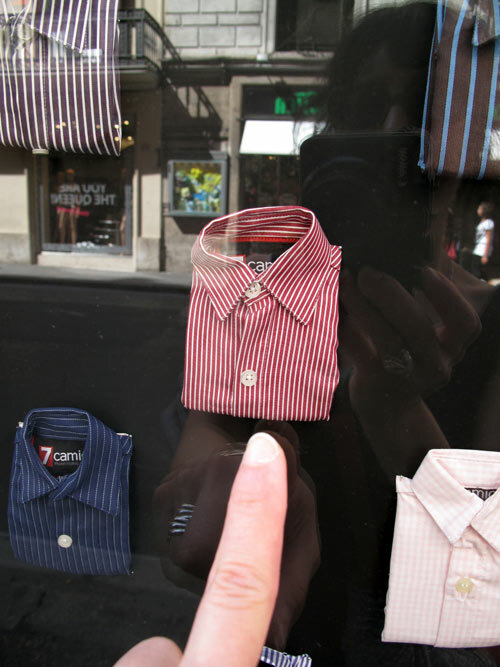 i stopped in my tracks when i saw this window display of tiny mens shirt samples in Rome. how cute are they?? so perfect. 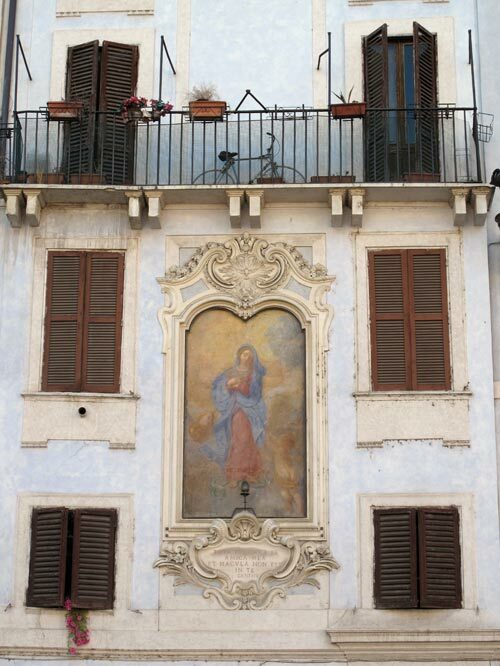 one thing's for sure, the Italians know how to dress well. i don't know how the women wear heels on cobblestone streets, but somehow they do! before Hugglets, we had a few days to run around London. 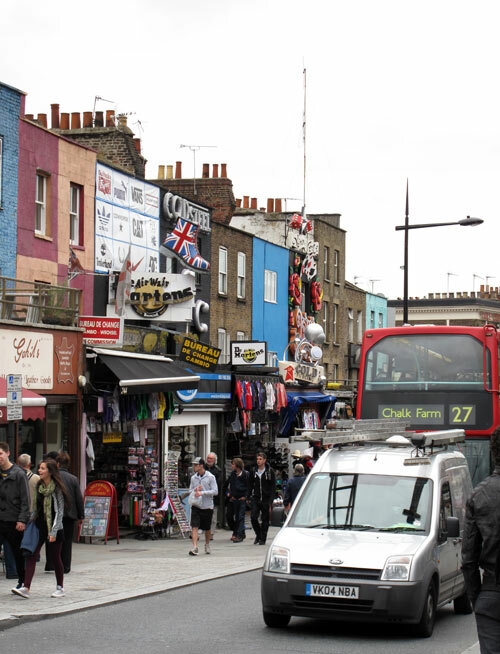 above: colorful Camden. 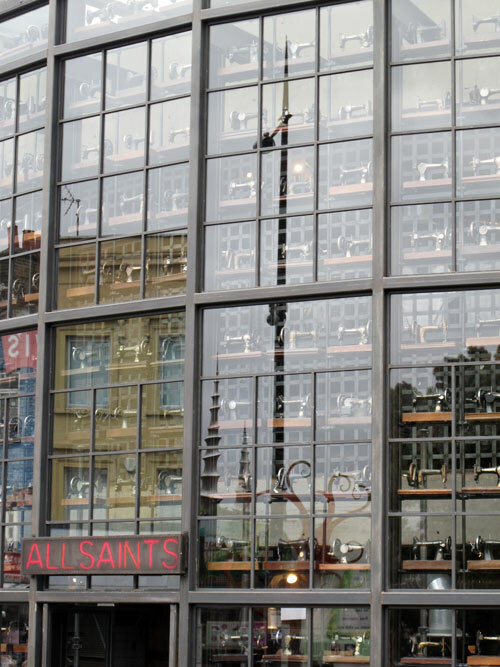 this clothing shop had an enormous window display full of antique sewing machines. we strolled through parks, museums, neighborhoods and Hampstead Heath. but i know what you're really waiting to hear about is the bear show!!! 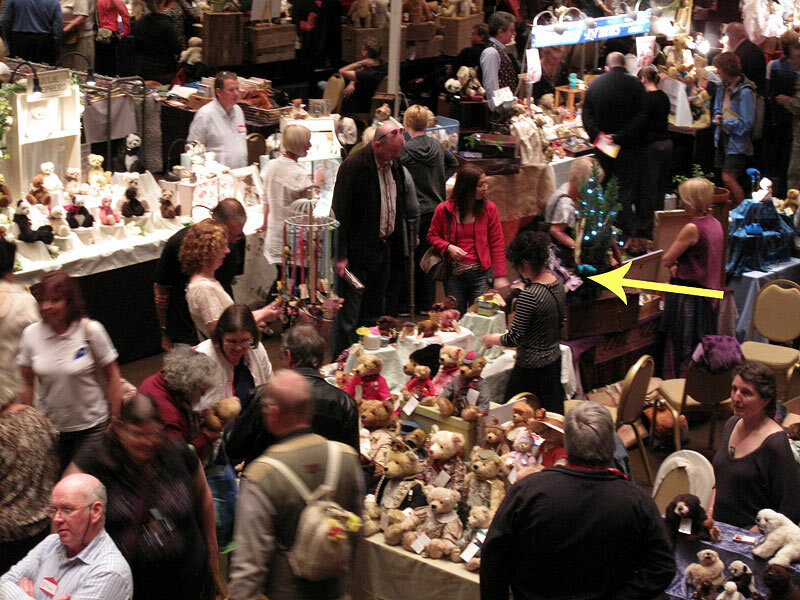 there i am in the sea of collectors and exhibitors. a large crowd poured in right at opening time! my spirit bear necklace display, and table neighbors Whittle-le-woods bears from UK. 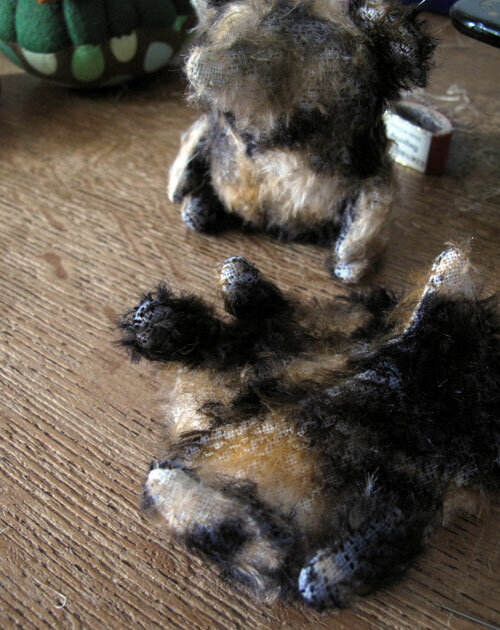 more bears and mohair fabric galore! a birds-eye view from the balcony. click on any of the photos to see full size. 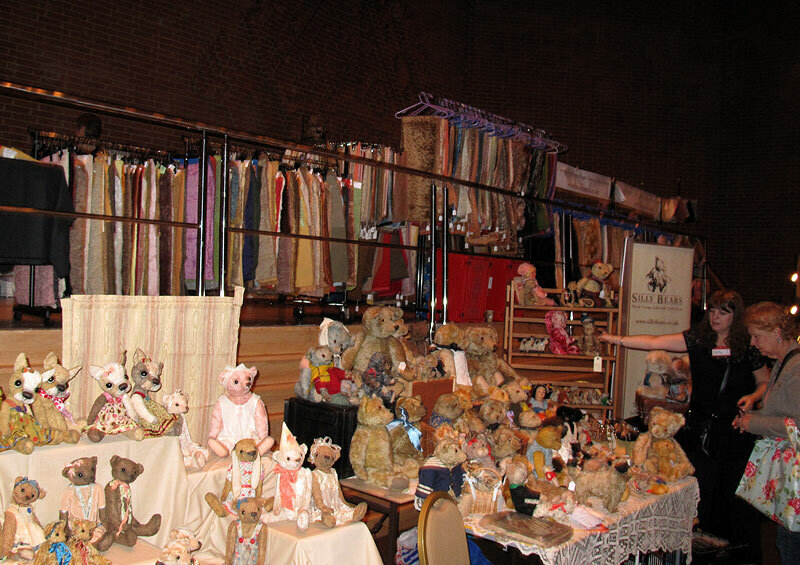 Hugglets was by far the largest show we've exhibited at- three floors of bears! 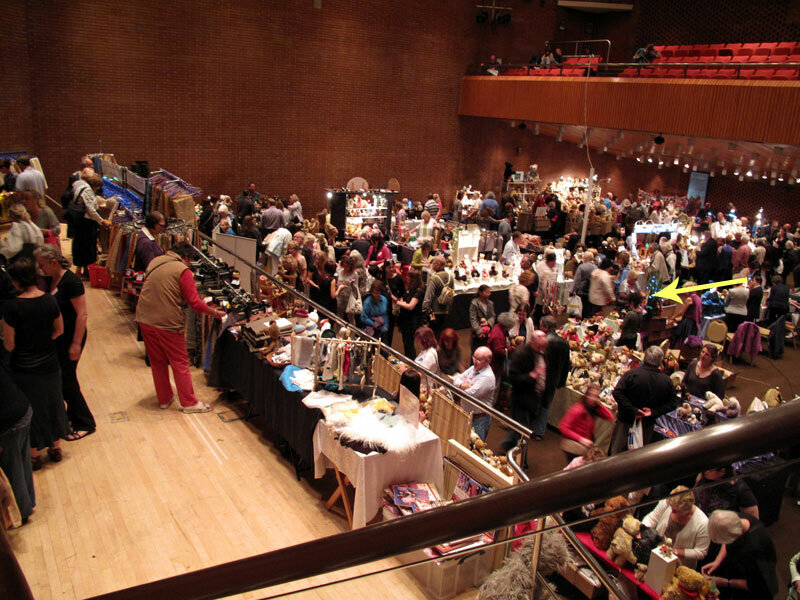 the show went really well for us and we hope to return next year. as much as i wanted to see each and every bear (and there were a ton) i hardly left my table. so i sent Rob, my patient show assistant, off to take some pics at opening time. 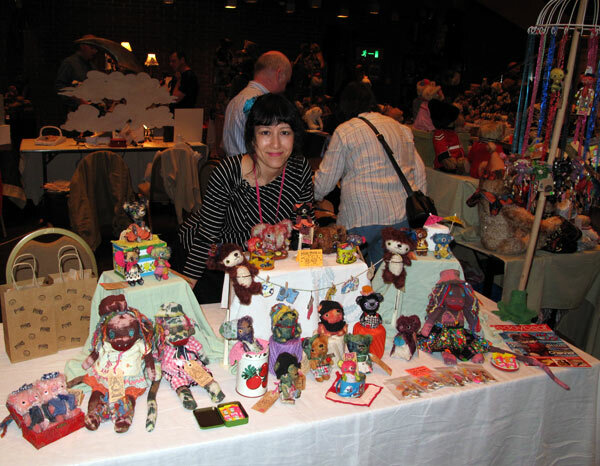 it was wonderful to meet collectors, fellow artists + their assistants, budding bear makers, Felicia the bear scout, Glenn and Irene who put on the show, and...Marsha from Abracadabra after all these years! Chatham Village Bears' Art Rogers and George were also exhibitors- twas they who suggested i exhibit at Hugglets and helped me in so many ways. 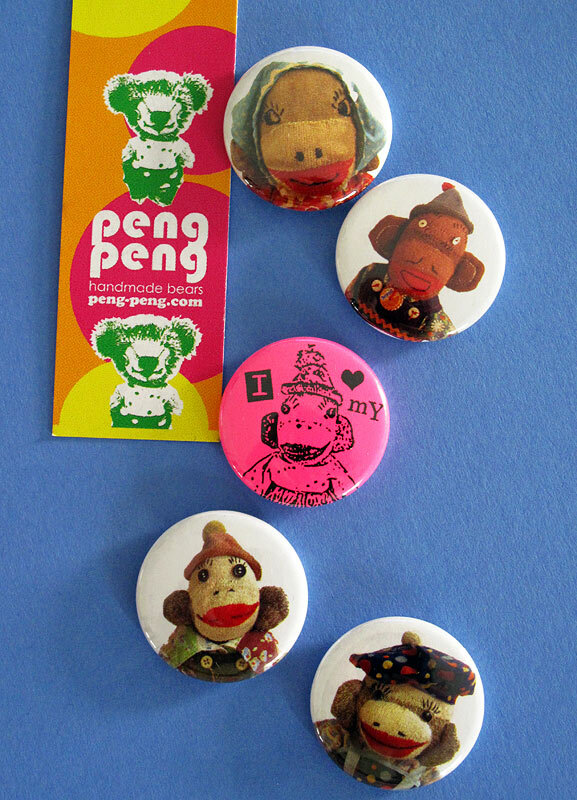 *thank you* special people who adopted bears, elephants, monkeys, pin sets and spirit bears that day! it was a pleasure chatting with you and it really warms my heart to know that people check my web site and blog and follow what i do :) it's amazing how bears connect us from all parts of the world! 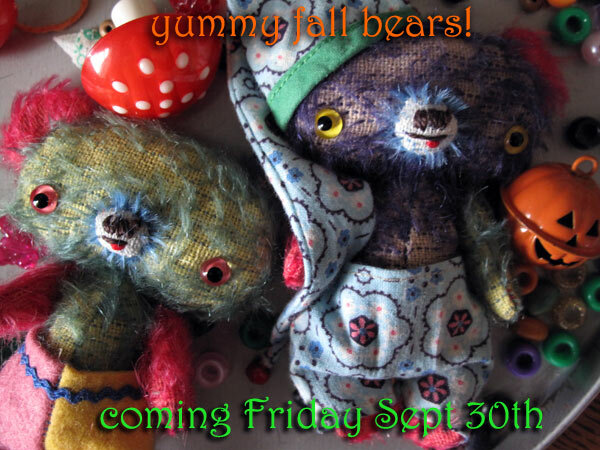 if this whetted your appetite for bears, stay tuned... i do have a few special pieces from the show and will be working on fall-themed (spooky, halloween-y) bears to be available for my next web update. i'm aiming for the update to happen by end of this month. hello! we are back from Hugglets/ London-Rome trip! 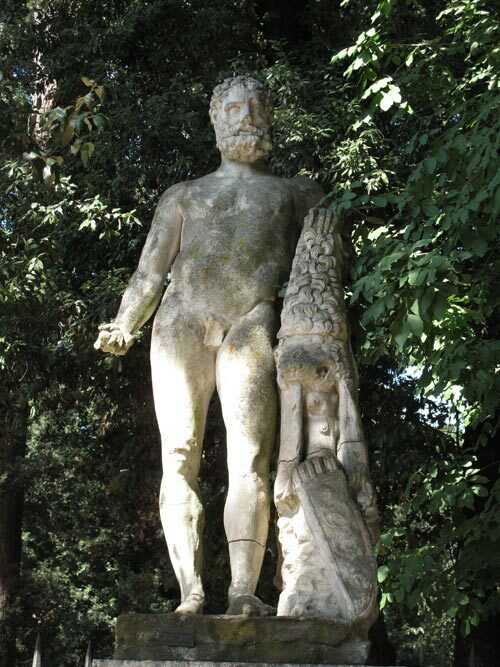 we explored from Marble Arch, London to marble arches of Rome, Italy. 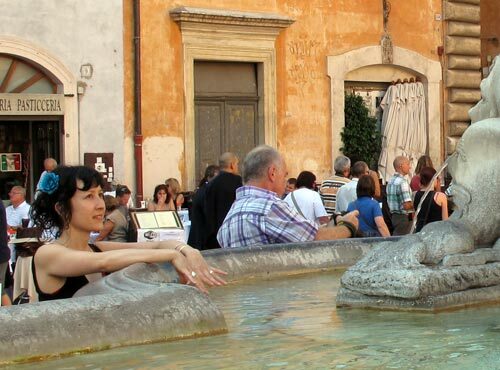 here are few pics from the eternal city... yes, everywhere looks like that; fountains with fresh potable water piped down from the hills via ancient aqueducts, huge old marble sculptures, frescoes/ mosaics, cafes and shops along narrow cobblestone streets. it was our first time there and it was just how i imagined it. yesterday we had a 9+ hour flight from Roma with a 4 hour layover in New Jersey, then a 2 hour flight to Chicago, and finally a cab ride home. we've been on every mode of transportation except a pogo stick! so today we are taking it easy and getting unpacked. i know you must be eagerly awaiting some Hugglets photos/ show report! i'll tell you all about it tomorrow once i sort through my photos. 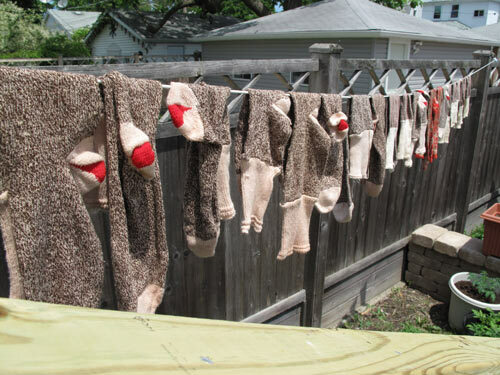 meantime, enjoy the 2011 festival pics on the Hugglets web site- click on any photo for slide show and see my spirit bear necklace display on photo #27 and me posing with a sock monkey #77.
our handy retractable clothes line in our backyard. got it at home depot. i am taking a quick sewing break to "vent" about dryer vents. it boggles my mind when temps are 80-90 degrees and neighbors have their air conditioners cranked, while simultaneously heating up clothes in a dryer for 1-2 hours, then rebooting again for another 45 minutes. 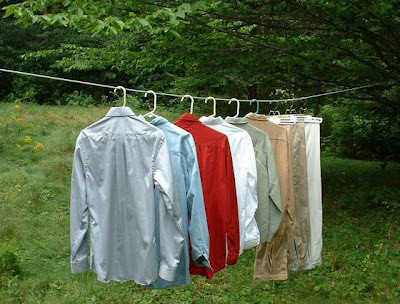 i hang a queen-sized sheet outside and it's dry in 10 minutes and smells like sunshine. 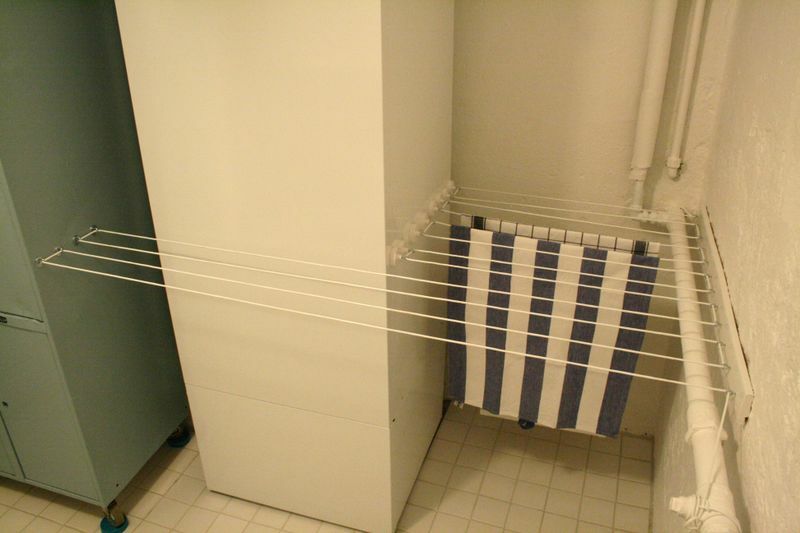 we lived in a condo previously so i understand that some places have by-laws where you're simply not allowed to hang laundry outside, or perhaps you don't have a yard. here are some easy, cheap solutions to save energy, utilitie$, and above all... put an end to using those toxic, heavily fragranced dryer sheets! bounce those bounce sheets out of your home. 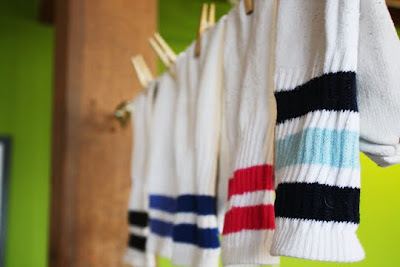 btw, hanging clothes indoors during winter helps humidify the house. that's on our project list for fall!